Many different terms are used to describe steam in various applications. This inconsistency can result in improper reporting and work order errors. 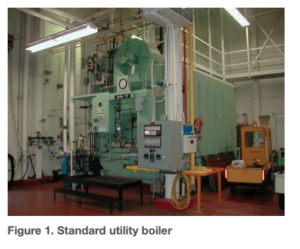 This paper addresses utility steam applications. Any steam application outside of utility steam should follow company policies and regulations of any governing agency or organization. Utility steam is sometimes called “live steam” or “plant steam.” It is steam produced from the boiler operation using softened water, reverse osmosis, or water otherwise treated for the boiler. Utility steam makes up the majority of the steam consumed by industrial process applications. Utility steam is a dry and invisible fluid that contains both sensible and latent energy, which can be provided to the process as saturated or superheated steam. The latent and sensible energy component of the steam will vary depending on steam pressure and temperature. The only chemical transported with the steam is a corrosion inhibitor (amine), which is injected in the steam line. Otherwise, utility steam is a clean, invisible vapor that contains a tremendous amount of energy. “Live steam”and “plant steam” are other terms used for utility steam depending on the facility, industry, or region, but they all mean the same thing—water that is heated in a boiler to produce steam by using water that has been prepared for an industrial boiler. Saturated steam is a state that steam can achieve with certain heating parameters. Saturated steam results from water being heated to a boiling point. More heat is then added until the steam vaporizes(latent heat of vaporization). Saturated steam occurs when both the liquid and the gas phases are present at a given temperature and pressure. Saturated heat has properties that give saturated steam many advantages over superheated steam, including: rapid, even heating throughout the heat transfer; the ability to control temperature through pressure; and a high heat transfer coefficient. 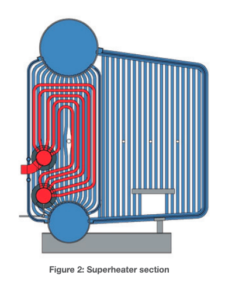 In particular, this high coefficient is why heat exchangers primarily use saturated steam instead of superheated steam. Superheated steam is created by the process of continually heating saturated steam until it is heated beyond the saturated steam point, thus increasing the steam temperature without increasing the temperature. The properties of superheated steam include having a higher temperature and lower density than saturated steam at the same pressure. Superheated steam is used in a variety of ways due to its ability to cool and still retain the same state and not produce condensate. These properties make superheated steam crucial in its ability to power devices such as turbines. Steam turbines take the superheated steam and use it to flow through nozzles and spin the internal components of a turbine, which power a shaft that can be used to generate electricity or power process equipment. However, the turbine process lowers the pressure of the steam and reduces its temperature slightly. 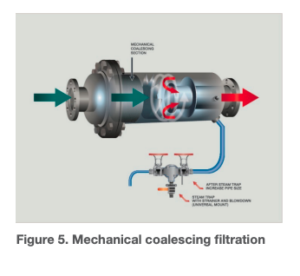 The advantage of using superheated steam in this application is that the steam remains ultra-dry through the steam turbine without forming condensate, which could cause premature failure in the turbine. Superheated steam has some disadvantages such as a low heat transfer coefficient, variable steam temperatures at a constant pressure, and more expensive steam components due to higher temperatures. Also, the vast amount of latent energy cannot be released until the steam achieves saturated conditions. Therefore, there is no superheat in the steam. 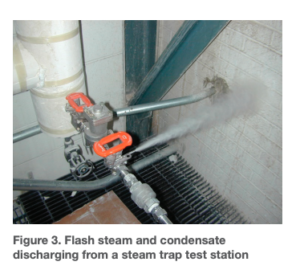 Flash steam is produced when high temperature condensate is discharged to a lower pressure system. The condensate is at the same pressure and temperature as the steam in the process; therefore, when the condensate is exposed to a lower pressure, it has more energy than it can contain at the lower pressure. The additional energy of the higher-temperature condensate results in energy being released into the vapor or flash steam (latent heat of vaporization). Flash steam is no different from utility steam in energy or quality.The name “flash steam” just describes how the steam is formed. The energy produced from flash steam is always reused in different processes. Culinary steam is steam directly injected into food-related products to clean or sterilize their contact surfaces. The steam must follow 3-A Sanitary Standards,Inc. (SSI) Accepted Practice 3A-609-03, corporate policies, and the regulations or rules of any other governing organization. Culinary steam typically contains additives that prevent corrosion within the steam system. The steam is filtered to ensure that no corrosion or other contaminants enter the process. 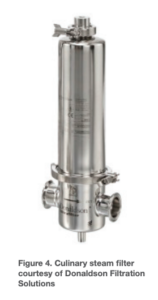 After any needed filtration is installed, all steam components and piping/tubing must be stainless steel.Coalescing steam filters that are used before the process or contact with product can remove excess condensate, particles of rust, pipe scale, and other contaminants as small as 0.1 μm to an efficiency of 98%. Any chemical additives injected into the steam line for corrosion inhibitors must meet all applicableFDA and USDA requirements. The benefit of culinary steam over pure steam or clean steam is that it is more economical to produce and operate the process. Culinary steam requires yearly or semi-yearly maintenance on the filtration system. Filtered steam is used for applications such as sterilization, where any contamination can negatively affect the final product or process. Utility steam has to be delivered through a strainer and then filtered to remove impurities such as rust, corrosion materials, and condensate that could be in the steam piping and become entrained in the steam flow. The steam filter must be capable of removing particle sizes as dictated by the company standards or governing rules or regulations. For example, hospital sterilizers must comply with ANSI/AAMI–ST 8: 2013. After the steam is filtered, all downstream steam components and piping/tubing should be stainless steel. In the world of steam systems, the expressions “pure steam” and “clean steam” are used frequently, but these two expressions are not necessarily interchangeable. Good manufacturing practices (GMPs) often refer to the term “clean steam” without any further explanation. The steam’s quality is defined by its use, and its quality is regulated in standards and pharmacopoeias (see the next section). • water for injection (WFI). When to use clean and pure steam is determined by GMPs. These are general rules applicable to pharmaceutical manufacture and are detailed in the Code of Federal Regulations (CFR Title 21, Part 211). They do not provide any specific recommendations regarding steam, but they do present general requirements for facility systems, equipment, and operation needed to prevent contamination of pharmaceutical products during manufacturing. The quality of this steam is defined by its condensate, which must equal WFI. Clean steam is necessary to sterilize primary packaging material for sterile dosage forms and to sterilize equipment parts in contact with the product during production. The United States Pharmacopoeia (USP) was the first organization to publish requirements for pure steam in 2006. Another publication, the European Pharmacopoeia, maintains that distillation is the only acceptable way to produce WFI. Although some pharmacopoeias allow alternative production technologies, distillation is the technology of choice and the industry standard for generating WFI. In contrast to the steam described in the pharmacopoeia, the maximum conductivity of the condensate in the ANSI/ AAMI standards is 10 µm/cm, above the limit of WFI. The ANSI/AAMI standards also indicate a limit for non-condensable gases. The USP similarly mentions non-condensable gases but without any specifications. Non-condensable gases can cause the occurrence of gas bubbles in areas that are difficult to access, which can prevent the steam from reaching the temperature required for sterilization. The presence of each gas means that pressures have to be calculated differently; the total pressure of mixed gases consists of the partial pressures that each gas or vapor exerts. Clean steam and pure steam are used in the pharmaceutical and healthcare industries in processes where the steam or its condensate may come into contact with a pharmaceutical or medical product and cause contamination. Steam from a conventional boiler (utility steam) is unsuitable for pharmaceutical and medical applications because it contains boiler additives or other undesirable materials such as rust. Pure steam is often used to produce organic products, including food, that restrict usage of chemicals and additives. It is also used in the healthcare industry and is required to produce most pharmaceutical products. Other uses of pure steam include: autoclaves, sterilizers, and humidification of air conditioners for ventilation of clean rooms. Pure steam is used in products that have strict endotoxin limitations and is required for end products such as injectables and intravenous products. A specification for clean steam may be based on the PW specification insofar as the chemical composition (TOC and conductivity). This would be appropriate in facilities producing products that must be sterile but where endotoxin in the final product is not a concern. An example of this would be non-injectables. For biopharmaceutical companies that do not have to meet FDA standards, these guidelines do not apply. 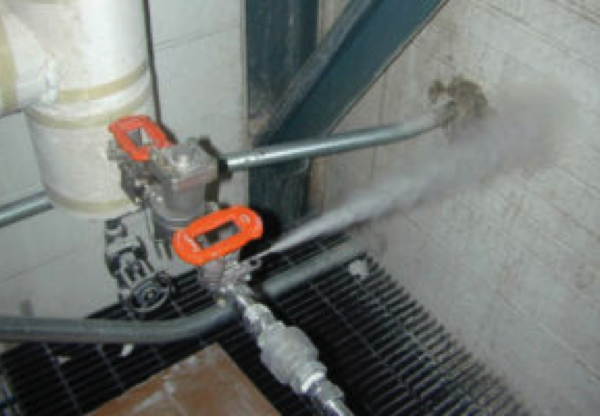 In addition, many installations use clean steam applications where pure steam should be used. An FDA-approved site should use pure steam for the humidification of critical areas and either pure or clean steam for non-critical applications. Non-FDA sites may use clean steam for humidification. 1. Engineering Edge, LLC. (n.d.). Temperature Entropy (T-s) Diagram—Thermodynamics—Thermodynamics. 2. Mueller (n.d.). Pure Water Solution—Pharmaceutical. 3. Robert Bosch (n.d.). Pharmatec GmbH.